UPDATED NEWS: May 20, 2013 edition of the Walrus Magazine. (Toronto, Ontario) contains a story by Julian Sher regarding the Walchuk Case. Julian Sher, is an investigate reporter with the Toronto Star and the author of 6 books. He has done extensive research in this case, and presents his findings under the Crime, Trials and Errors heading of this publication. Mr Sher, explains how that bad forsenic evidence and junk science continues to send innocent people to jail. He also shows how our Justice System makes it difficult for people who have been wrongfully convicted to clear their names. The information contained in this story will be a real eye opener for those who believe that our legal system is fair and just in all cases. It is an EXCELLENT read. I would like to thank all of the individuals who have worked or are still working on my case. Getting things to this point has taken a huge amount of time and effort. Your work is and always will be much appreciated. A PICTURE SPEAKS A THOUSAND WORDS..........THE TRUTH SHALL SET HIM FREE!! This irrefutable evidence should force the justice system to take a fresh look at this case and overturn the wrongful conviction. Effects from pouring gasoline on the stairs and lighting them on fire. One can see very little damage to the wood. The plastic runner has melted and the wood is smoked. 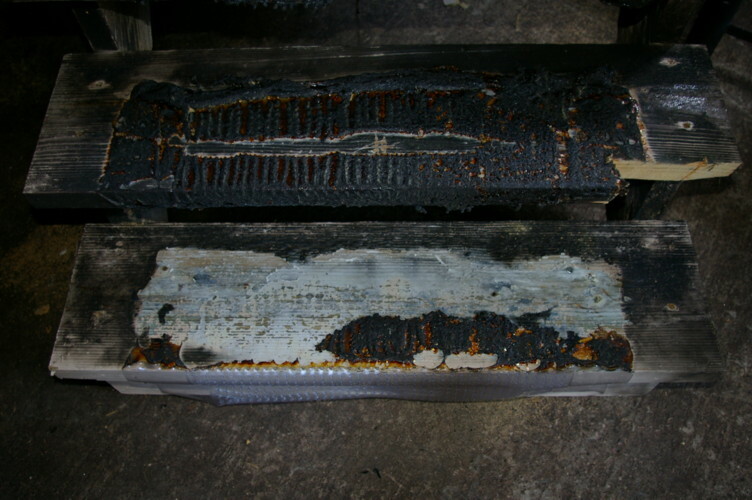 It is also obvious that the wood under the runner is not damaged at all. Effects of burning material dropping down on to the stairs as predicted by the experts. 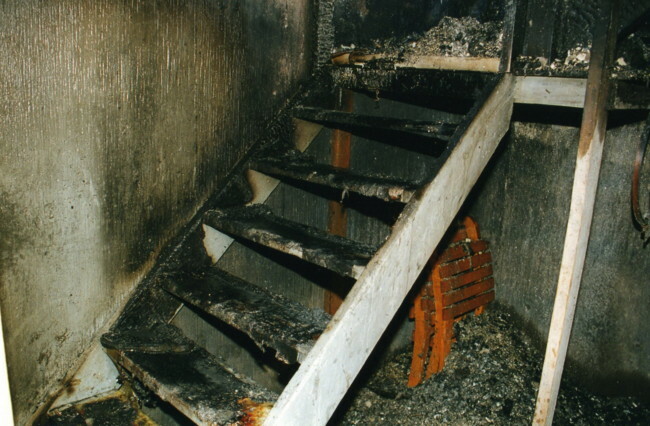 The result is identical to the stairs in Leon's home after the fire. Actual stairs from police photos. 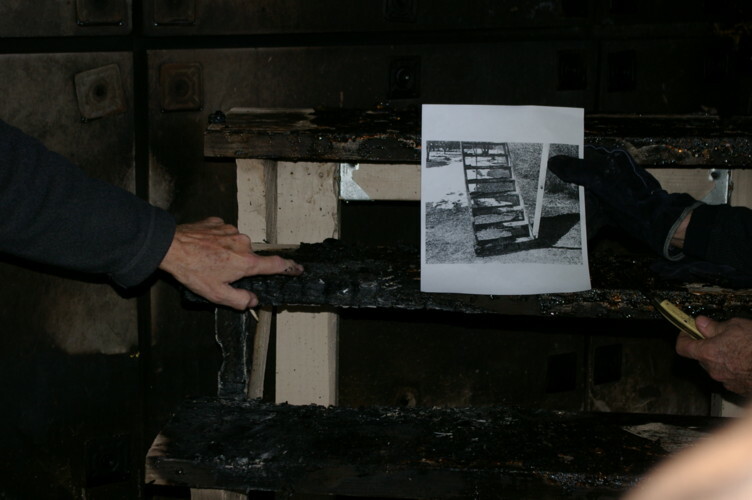 Comparing the two photos, one can see that the outcome from the experiment proves that the burn patterns are identical to the burn patterns from Leon's home and that the first picture, which is what the Crown's fire expert's theory was, doesn't look anything like the physical evidence. Leon is trying to have certain exhibits released for retesting. A simple request; an unusual, confusing response from another Saskatchewan Judge. Leon is simply asking for the release of two original Crown video tapes and two Crown photo negatives for further analysis and enhancement by experts in Vancouver. This enhancement could show vital evidence in Leon's favor, that may have been omitted. Evidence that should have been disclosed by the RCMP and the Crown prosecution. If the Crown's disclosure was absolute and in full, they should not be afraid to release the requested exhibits for further examination. Instead, they insisted that Leon's lawyer obtain a court order and in doing so, Leon once again received a "highly unusual" ruling. This is not a new request by a wrongly convicted person. There is much case law and precedent for further evidence testing from a number of Canadian cases that have eventually led to wrongful convictions being overturned. 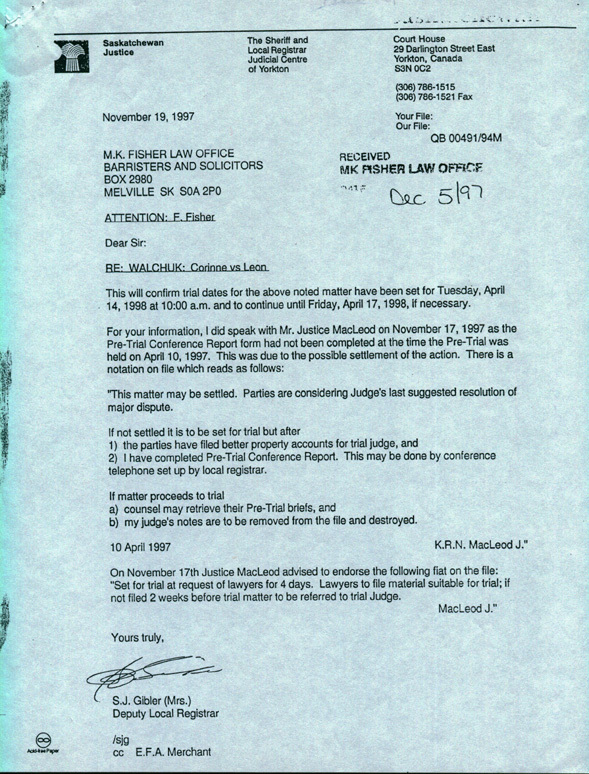 Madam Justice J. E. McMurtry's Ruling April 10, 2006 Note that she made her decision on April 10, yet the document was not sent to Leon's lawyer until April 17, 2006, a loss of seven days out of the 30 days for filing an appeal. 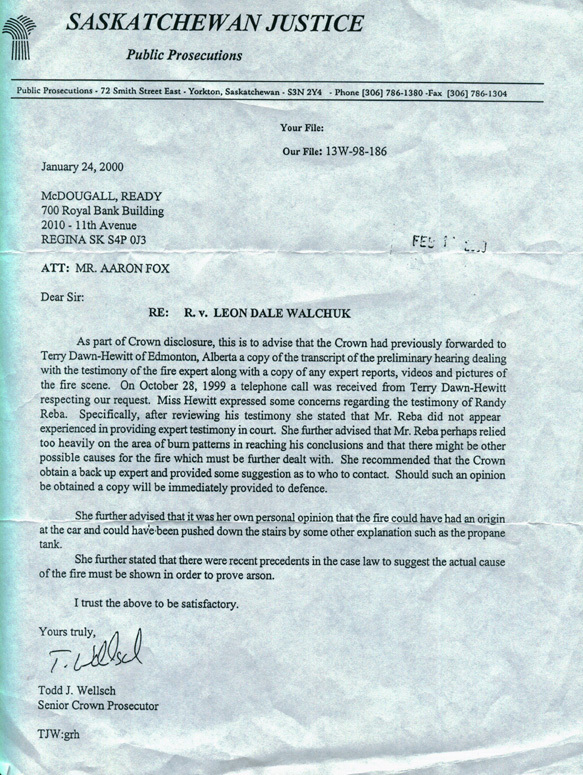 Fire report of Peter Pendlebury from 2001 which contains cause and origin of the fire. Further proof that Leon is innocent. Jim Fairbank, the Crown's expert witness at trial. Here's his fire report. The media has once again only told part of the story, the part they only want the public to hear. We will do our best to keep the public accurately informed with the truth. Wawanesa Insurance is trying to have the court throw out Leon's civil suit citing "abuse of process". They believe that because Justice Kyle found Leon guilty of murder, they should not have to pay out the insurance claim. This action erupted only after the overwhelming evidence proving the cause of the fire was filed and after the payment to secure a jury was paid. It seems quite obvious that someone is afraid of this matter being heard in court once again especially when the decision of there being no arson would be decided by reasonable civilians. One must also remember that the Crown's fire expert, ex-cop turned fire investigator, Jim Fairbank never determined the cause of the fire, nor could he say whether the fire was accidental or intentional. He also got a nice new job with Wawanesa Insurance shortly after the conclusion of the criminal trial. Leon's pursuit of justice is not without merit. The Association in Defence of the Wrongly Convicted (AIDWYC) is also reviewing the case because of the fresh evidence that proves Leon's innocence. There was not a murder here. There is proof that Leon did not start the fire. Proof that his ex-wife's injuries would not have caused death. Proof that Leon could not have driven the car. This enormous amount of evidence can not be ignored by the courts and especially not by the public. Peter Pendlebury's report is posted above. "no reason based on the physical evidence at the scene to doubt the testimony of Mr. Walchuk. The physical evidence at the scene points to an accidental fire and not arson. The evidence purported to show arson does nothing of the kind. This is a classic case of a finding of arson which could only be reached by ignoring teachings and admonitions of NFPA 921 and other well-accepted learned treatises in the fields of fire investigation and fire dynamics." Another judge with his ridiculous ruling becomes part of the cover up. BILL MATHESON joins with LARRY KYLE, STEWART CAMERON, NICK SHERSTOBITOFF, GARY LANE contributing to keeping an innocent man in prison. The lawyer for Wawanesa Insurance recognized that the evidence supporting Leon, would certainly throw the criminal conviction into doubt. Thus, instead of giving Leon his day in court, with a jury, Matheson chose to side with his colleges and continue to keep an innocent man in prison possibly for the rest of his life. The public needs to know that the reason Leon's case isn't being heard is not because of a lack of new evidence or strong evidence but because of significant findings by highly qualified experts which undoubtedly insure a positive outcome for Leon especially if this case is heard by an unbiased jury. Don't forget, this matter was proceeding along until Leon requested and secured a deposit for a jury trial as opposed to a trial by judge alone. It's seems that Wawanesa had little problem with this case being heard by judge alone, but changed "their tune" significantly when the jury was requested. This appears to say something quite interesting about our judicial system. Leon paid his insurance premiums to Wawanesa for 10 years prior to this and was in good standing at the time of the incident. This fire's origin was not determined by their investigator. All physical evidence supports Leon's version of events and dismisses any idea of arson. This evidence is based on science rather than speculation. Leon has the right to have his case heard especially given the huge bearing this matter has both on his criminal conviction, which he is still fighting, and his financial welfare. The amount owed to Leon by Wawanesa could reach $250 000 before punitive damages. Bill Matheson made a huge mistake. Leon will be appealing this ruling, but given past experience with Saskatchewan's Court of Appeal, there doesn't seem to be much hope in them doing the right thing. If the Court of Appeal would do the right things, than Leon's conviction would have been overturned by them in March 2001. It is expected that the appeal will likely be a further attempt to cover up for the grave errors their colleges have made along the way. SO MUCH FOR JUSTICE IN SASKATCHEWAN!!! Finally, after approximately three months, the Court is forcing Wawanesa Insurance to proceed with Leon's insurance claim. 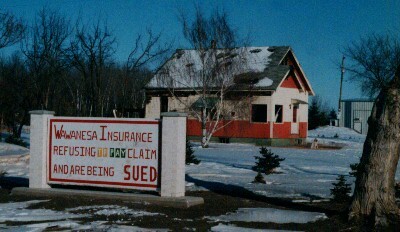 Since the fire in his home in 1998, Wawanesa has been less than cooperative in dealing with the insurance claim. 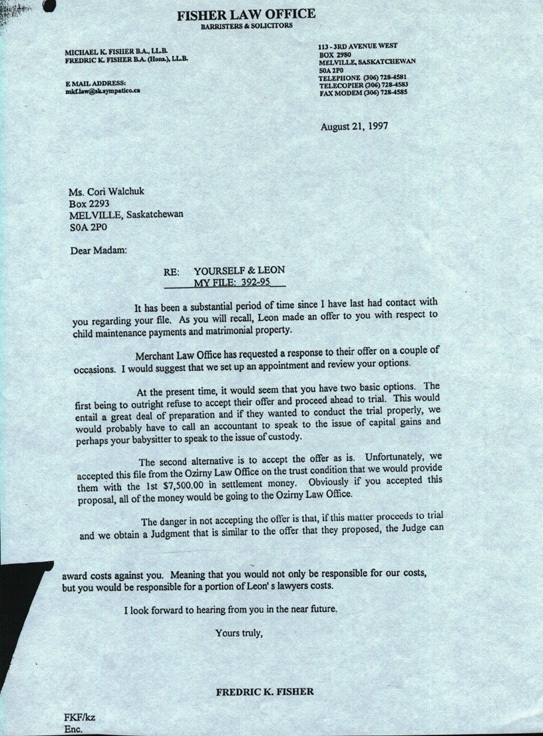 After submitting all the required paper work in June of 1998, Leon needed to retain a lawyer shortly thereafter when it was apparent that Wawanesa had no intention of dealing fairly with the claim. Over the course of more than four years, Wawanesa has avoided letters from Leon's lawyer urging them to move this matter along. Wawanesa requested "examination for discovery" with Leon, but delayed setting a date. After about a year, Leon's lawyer pressed them to set the date for the examination, but Wawanesa had a "change of heart" and stated that this step would not be necessary. When further correspondence from Leon's lawyer to Wawanesa's lawyer, went unanswered, Leon's lawyer served notice to the Court, which forced a Pre-Trial date to be set. While it is possible to resolve this type of action at a Pre-Trial, it is doubtful that Wawanesa will settle given the attitude shown throughout the past four years. It is our opinion that all actions thus far, point to a "trial by bankruptcy" attitude. Leon and his lawyer are fully prepared to deal with this matter on Dec. 17, 2002 in Regina, SK. On Tuesday, Dec. 10, 2002, Leon was notified that his application to attend the proceeding was denied after the Judge was told by Wawanesa's lawyer that they have no intention of settling and therefore it is unnecessary for Leon to attend. He will be appearing by phone. Dec. 17, 2002, the Pre-trial was adjourned for eight weeks in which time Wawanesa as requested and was granted that the following information be provided to them: quotes for the cost of repair of Leon's house, proof of contents, and expert fire report of Dr. Gerald Hurst Ph. D and Ken Gibson. Fire evidence that the Crown was aware of, yet refused to abandon their original theory. Instead of taking the advice of this expert and pursuing the more likely cause, found a less qualified witness to say what they wanted. It is sickening to think that this expert's opinion supported what Leon had been telling the police, and the Crown disregarded it and worked toward putting an innocent man in jail. 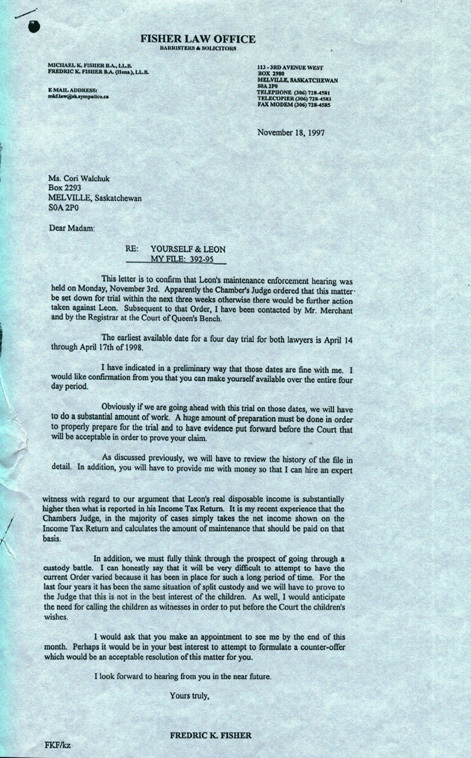 Letters to Cori, from her lawyer, dated August 1997 and dated November 1997, regarding the impending divorce trial. Letter to Cori's lawyer, Fred Fisher, from the Court House regarding the Judge's comments about the Pre-trial Conference. Proposed settlement offered at the Pre-trial Conference. This story could be an eye opener to people who have not had any personal experience with the Saskatchewan Justice System. It would seem to indicate that we have something less than a credible and just system, and something entirely different than what public perception might be. Leon Walchuk is yet another victim of a seemingly corrupt justice system where the police mishandled evidence either intentionally or by incompetence. All of the information provided on this site can be supported and proven by documentation and physical evidence. This information on this site, may change the way people view the term "criminal justice" in the province of Saskatchewan. This site is designed to tell the world about the injustices that seem too bizarre to be true, but the reality is that something like this can happen to anyone, at anytime. Allegations based on hearsay and rumors. Cops conveniently "lose" evidence that could have cleared Leon. 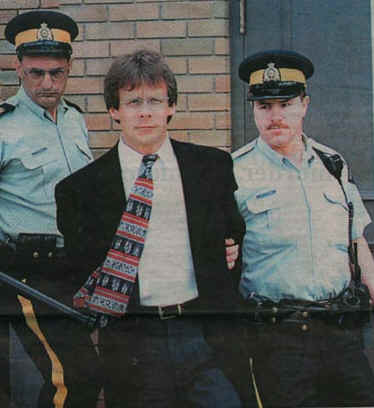 On June 14, 2000, Leon Walchuk was convicted of second degree murder of his estranged wife, Cori. The publicity in Saskatchewan said that Leon murdered his wife, threw her in the basement of his house, and set the house on fire on March 30, 1998. Defense witnesses and evidence showed Corinne's death as accidental. The Crown's theory that Leon rendered Cori unconscious by severely beating her, dragging her through the porch of the house, down eight stairs, drove her car into the porch, and finally starting the house on fire, was not supported by the evidence presented at the trial. There was no physical evidence to back up the crown's theory and the cause of fire was ever determined. The trial judge, Justice Larry Kyle, stated, on record, near the end of the trial, that "there are two stories, and I have to determine which one is true." The job of the judge is to determine innocence or guilt based on the evidence put forth. The crown must prove beyond a reasonable doubt that Leon is guilty. This, they did not do. Leon is an innocent man! The cause of death was carbon monoxide poisoning related to the fire. We are a site under construction, and ask for your patience as we load what are volumes of legal documentation to this site. We hope you will check back regularly for the latest updates and information. We will be happy to respond to any comments or questions you may have. March 5, 2001 Saskatchewan's Court of Appeal upheld the conviction and sentence despite the fact that the panel of judges agreed with the defense's arguments. The appeal was heard in front of Justice Cameron's panel. Leon had a previous matter, related to the murder charges, that went before the Court of Appeal on which Justice Cameron presided and was also dismissed. This again is another example of unfair treatment by the Justice system as Cameron could not have been impartial in this criminal matter. The facts and information printed on this site are taken from the trial transcripts and lawyer submissions to the Court.